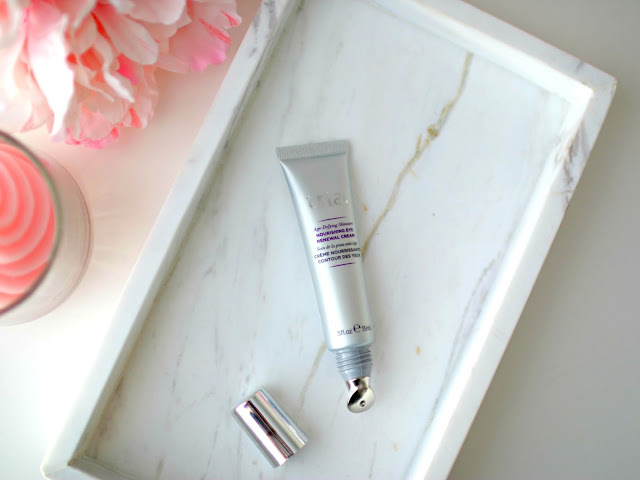 This post is brought to you by Tria Beauty via Pretty in My Pocket. All opinions are my own. Testing out beauty products is one of my favorite things about blogging. And I really get into it. I'm talking notes, charts, spreadsheets, pics, sometimes even petri dishes...whatever it takes to give YOU the best review I can. And today's post is 8 weeks in the making. As I get older, I become more and more concerned about my wrinkles, wrinkles that are there from sun damage, from not having a skin care routine when I was younger, and from having dry skin. 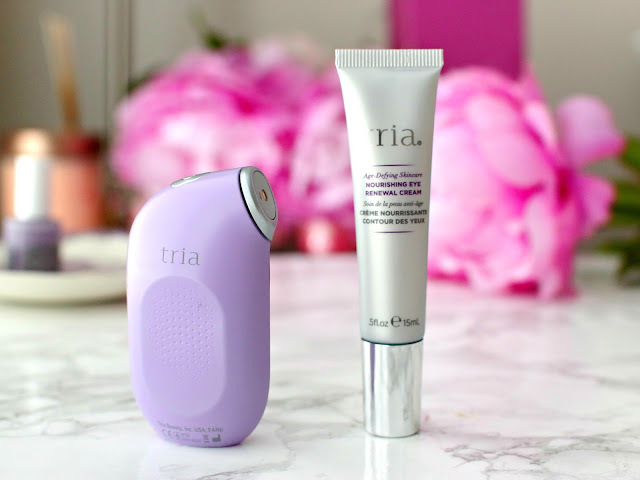 I had a chance to try out the TRIA Eye Wrinkle Correcting Laser, and I was so glad I did. I'd never used any sort of laser treatment before, and didn't know what to expect. If you've been following my blog's Facebook page (click here to see) you've seen my weekly progress. For those who haven't, let's get caught up! Today I will share my experience over the past 8 weeks. TRIA Eye Wrinkle Correcting Laser smoothes fine lines and wrinkles, smoothes skin, and delivers a radiant, more youthful complexion around the eyes by the use of fractional non-ablative laser technology. Non ablative simply means that the wavelength of the laser heat up the water in the skin tissue, causing a stimulation of the creation of new collagen. The Tria Eye Wrinkle Correcting Laser is FDA cleared for home use and is designed to specifically treat the fine lines around the eyes. It is made for ALL skin types and tones. Move in small circles in the eye area for 1 minute per eye area, per day. It shuts off when your time is up. Full directions can be found here. Lasers feel like a rubber band snap on your skin. It’s not painful. The first time it was a little uncomfortable, almost like a sunburn. I found that by keeping it moving, it didn't bother me at all. I got used to it. Don't expect overnight results. It will take a few weeks. Your skin may be tender. Make sure you use the aftercare cream (like the one pictured above) and apply an SPF of at least 30 everyday. Your skin will redden and/or shed/peel in the areas that the laser is actively working to stimulate collagen and elastin - it means it’s working. Mine didn't peel, but it was red the first time I used it. I love to do treatments on my skin (like peels and scrubs), but I completely avoided anything near my eye area during the treatment period. 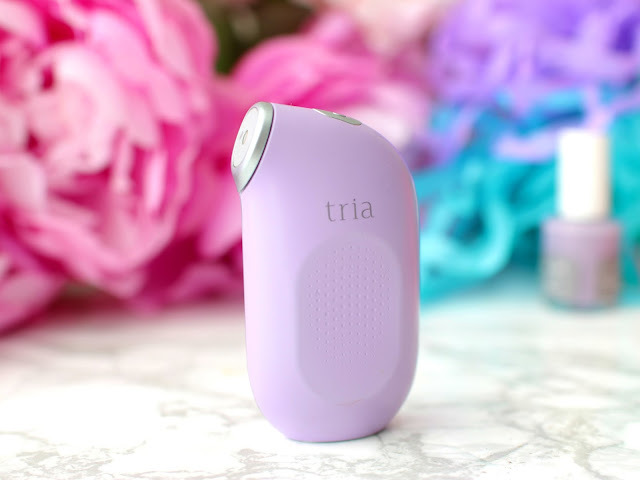 I don't have huge wrinkles, but they are there, and by using my Tria, I can definitely see where they are now gone or smoothed out. I was really impressed with my results, especially since there was so little effort involved to get them! Only 1 minute per day, y'all. As a Power Primper I am offering 15% off + free shipping with promo code, if you'd like to order one for yourself. Expires: May 31, 2016 or when it runs out- only 20 codes available! Click here to order! Be sure to register for http://www.prettyinmypocket.com/ to share your own beauty reviews! Would you try this for wrinkles? Have you ever done laser treatments before at home? That's amazing that it only takes 1 minute/day. 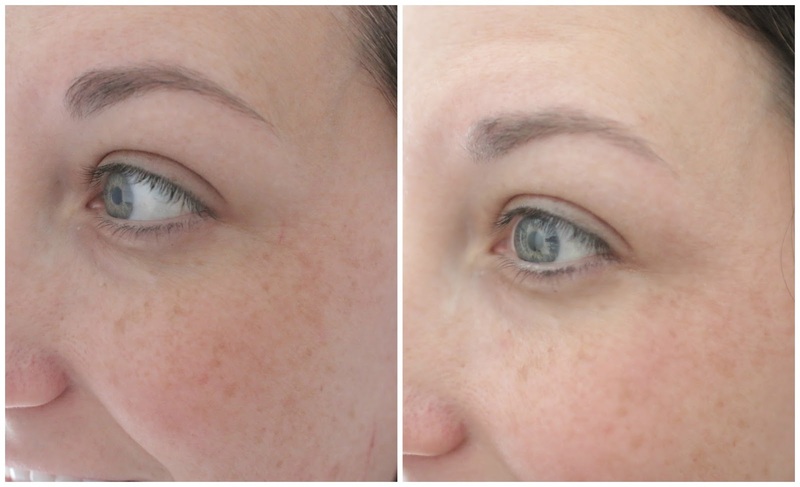 It definitely seemed to make a difference, not that you have many wrinkles! Have a great weekend, Elle! You barely have any wrinkles but you can definitely see that your skin is smoother after using it! I love that it only takes 1 minute everyday! That's so amazing they make at home products like this now. Technology rocks. I saw the results of another Power Primper using this and it looked like this gave her fine lines that she didn't have before. I think I'll pass on this. What an amazing little gadget! It looks like it really works even though you are beautiful already! Happy Friday! Thanks for sharing! I do see a difference. I am intrigued for sure! Have a great weekend Elle! Wow! You can really tell a difference from when you first started! The wrinkles aren't all gone, but they're definitely smoothed out like you said! The TRIA sounds like a great product! It's cool to see more at home treatment devices like this coming out. This isn't something I think I need yet but I would definitely consider using. Thanks for the intro Elle! I am starting to get concerned about wrinkles as well. I have some sort of rash on my eyelid that is making it scaly and wrinkly and it burns when I put lotion on it. I don't know how to make it go away! I thought that it was just me getting old age wrinkles at first. This product seems to work! You can see the difference right under your bottom lash line. So cool to see all this new technology. You do not have wrinkles girlfriend! This sounds like a great product! I love doing product tests too! That is really exciting that there are at home products like this!!! If it works, I would totally try it. One minute a day is nothing! I had to enlarge to see any fine lines and even then they were teeny tiny on you, but they are practically gone now! I am impressed! You have some great skin before and after! Sounds like a great product to try! Oh, I am so curious to try such a device, especially now that I have seen the results. Not that you had much wrinkles to start with. I'll be honest, using this would really freak me out! But it sounds like it's worth it if it smooths out wrinkles--I've been noticing more lately too, yikes! Great review! This is the first time I'm hearing about the Tria...I'm defintiely becoming conscious about wrinkles too so it's great to know that it worked for you. Luckily you really don't have many wrinkles at all! This is definitely something I would love to try! Glad this worked so well for you! I haven't tried anything like this, but I would. Love at home treatments! I know I will get wrinkles as they are inevitable, but the thought of crows feet terrifies me. Nothing else about aging does, but that. I've been using eye cream for a few years. I will do anything to put it off as long as I can! True, I was going to say that you are young and I never saw wrinkles on you, but I think this product is awesome, cause it massages skin - I so want to have this device now! I think I need to try this. I've started to get wrinkles and I am NOT happy. I'm trying to see wrinkles on both pictures but I just can't! Your skin does looks a little plumper and smoother on the second one, wich is pretty darn impressive. would definitely wanna try this for future uses! That's so cool! Maybe I'll see if my mom wants this for Mother's Day since I haven't gotten her anything yet (I know, I'm slack). Great review! I don't have any issues with wrinkles, but if I did I think this would be worth giving a try! I have seen this a little on your Facebook. I have seen informercials for Tria. It sounds like it does the job properly with very little pain and now that I am in the mid 30s I kind of want to try it. How pricey is it? Wow. Looks very promising for wrinkles. I'm always intrigued by gadgets like this...thanks for sharing your results with us!